Members of the Weller family now face charges of battery, mob action and a hate crime after allegedly beating up a 15-year-old black boy in Canton, Ill.
An Illinois family is facing multiple charges after, police say, they beat up a black teenager while shouting racial slurs at a campground in Canton, WLS reports. 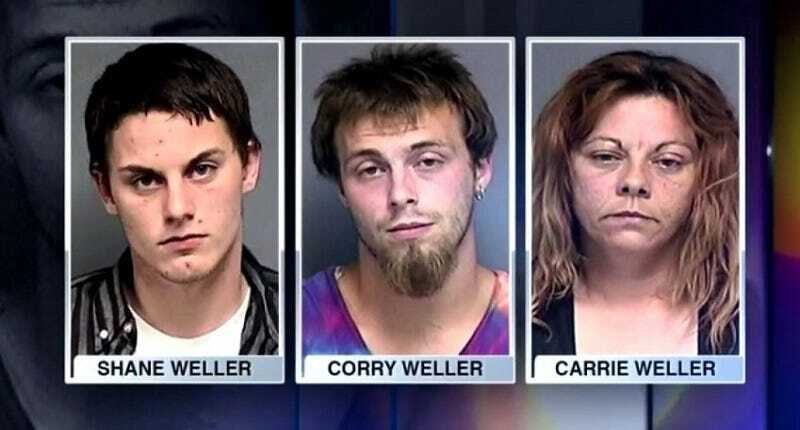 Carrie Weller, 42, and her two sons—21-year-old Corry Weller and 19-year-old Shane Weller—are facing charges of battery, mob action and a hate crime for the late-Sunday-afternoon beating of the 15-year-old boy. "They started beating him up and held him underwater until he was pretty much not breathing," the victim's mother, Tina Foley, told the station. Officers responded to a call about a fight and immediately took Carrie and Corry Weller into custody. Shane Weller was apprehended Wednesday night. The victim suffered minor injuries and did not require medical attention, but his family is stunned at what happened. According to the news station, Foley moved her children out of Chicago to escape the city violence, only to have one of her sons attacked. "I'm proud to be from Illinois, because I tell people from Alabama, you know, it's not like that up there. And hell, here I've got a video of people trying to drown my brother, call him the n-word," the victim's brother Jordan Foley told the station.